With the cold weather setting in most music events are heading back indoors. Although the majority of the big outdoor music festivals are over the Owl's hosting a weeklong minifest that wraps up on Sunday. Of course there are plenty of opportunities to catch great live music that isn't in conjunction with any kind of festival, though there are some additional fests out there as well. Tonight Slow Club visits Schubas and Balance & Composure and Seahaven bring fourth-wave emo to Bottom Lounge. Tomorrow night the Topshelf Records tour hits Beat Kitchen and Fear Factory help kick off the third iteration of Cold Waves at Metro. On Saturday the Black Keys headline the United Center and YACHT kick it at Concord Music Hall. On Sunday the Orbert Davis CJP Chamber Ensemble play the Hyde Park Jazz Festival at Midway Plaisance Park and Limp Bizkit take the stage at Aragon Ballroom. Be sure to comb through Soundboard for all of the Reader's concert listings, and read on for some show picks from our critics. Also check out our "Best shows to see" Spotify playlist at the bottom of the post, which includes songs from by our recommended acts (and follow us on Spotify). "On their lyrical, meditative new album, Slant of Light (Thrill Jockey), the Philadelphia duo of harpist Mary Lattimore and keyboardist-guitarist Jeff Zeigler create the sonic equivalent of a dimly lit sauna, with all the enveloping warmth and permeating calm that implies," writes Peter Margasak. "Their four seductive improvisations float leisurely, without sharp edges or dissonance. Lattimore, who's collaborated with Meg Baird and Steve Gunn and in 2011 appeared on Thurston Moore's acoustic album Demolished Thoughts, plucks cascades of resonant notes that Zeigler swathes in amorphous, caressing drones. Her harp's natural tone complements Zeigler's synths, and occasionally she electronically manipulates the instrument too—her notes sometimes bend crazily, or accelerate and decelerate in clusters." "Danish duo the Raveonettes made their name in the mid-aughts partly because their take on rock 'n' roll was so specific—it existed right at the point where the fuzzed-out bliss of shoegaze abutted the sing-along shimmer of Phil Spector's wall of sound," writes Maura Johnston. "Most crucially, though, it had a leader-of-the-pack attitude, which defined early favorites such as 'Attack of the Ghost Riders' and even persisted on slightly less badass offerings, including their chiming 2003 single 'The Christmas Song.' By contrast, this year's Pe'ahi (The Beat Dies), which the band dropped in July, focuses on cracks in their cool. It opens with a relentless surf groove, but that gives way to Sune Rose Wagner's whispered, regretful poetry and a piano that sounds submerged under the ocean. 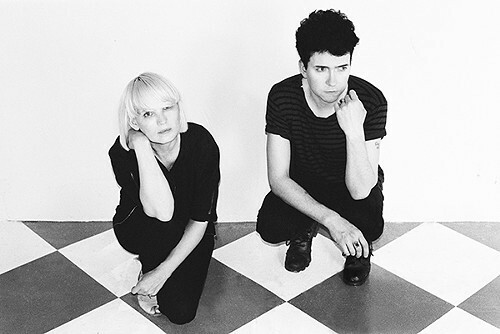 The Raveonettes have always maximalized their sound with distortion pedals, and Pe'ahi has a few swaggering guitar-and-drums jams." "King Crimson mastermind Robert Fripp has been constantly renewing his groundbreaking prog-rock outfit for nearly 50 years, always staying miles ahead of the curve, and last year he resurrected it yet again," writes Luca Cimarusti. "King Crimson's 1969 debut, In the Court of the Crimson King, not only blew minds but also destroyed pretty much every preconception about what a rock band could be. Fronted at the time by Greg Lake (later of Emerson Lake & Palmer), King Crimson blended psychedelica, heavy metal, free jazz, and classical music, inspiring and terrifying their peers and establishing a whimsical but meticulous blueprint for all progressive rock to come. Over the years Fripp has been the band's only constant member, and by 1974's Red, he'd pared down the lineup to a power trio, shedding the flutes and fairy-tale concepts in favor of knotty, heavy-handed math metal (meanwhile Yes and Genesis were still writing rock operas). The band's transformations have continued through five breakups and regroupings, as well as more lineup shuffling than most folks can be bothered to follow—more than 20 musicians have passed through, all of them among the best players on the planet." Tonight's show is the last of the band's three-night stint at the Vic. "Ikue Mori didn't intend to become a musician when she came to New York City from her native Japan in 1977," writes Bill Meyer. "But the downtown zeitgeist was right for first-timers to get onstage, so when singer-guitarist Arto Lindsay and keyboardist Robin Crutchfield invited her to drum in their band, DNA, she accepted. DNA became one of the leading lights of the no-wave movement, but Mori didn't start to develop the sort of music she plays today until well after the band broke up in 1982. Nowadays her instrument is a laptop loaded with processed drum-machine sounds and other samples. She's an adroit improviser—on Erik Friedlander's Claws and Wings (Skipstone) she creates insectlike atmospheres around the cellist's lush and melancholy melodies, and on a splendid duo with Steve Noble called Prediction and Warning (Fataka) she matches the drummer's quick rhythmic and textural shifts."